Let your IDE take care of your code. Smart, type-aware code completion, intelligent code inspections, live templates and intention actions all work together to help you code faster and fail-proof. Refactor your Ruby code the intelligent, language specific-aware way, with safe Rename and Delete, Extract Method, Introduce Variable, Inline Variable or Method, and more refactorings. Git, Subversion, Mercurial, Perforce, and CVS: RubyMine knows most common version control systems and SCMs and provides a unified UI for all of them. Easily configure automatic deployment via FTP or SFTP, and manage your infrastructure with Vagrant, Capistrano, Chef, and/or Puppet. Utilise database tools including a full-featured database editor and SQL support. 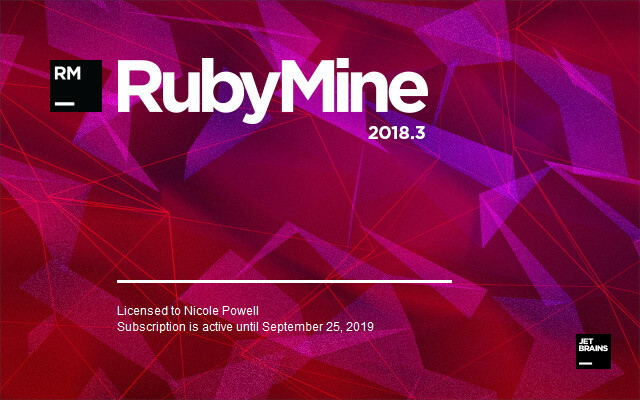 RubyMine brings dedicated RoR features including project structure views, quick Model-View-Controller navigation options, Rails-specific code completion, intention actions, and automated refactorings. All this, plus best-of-breed support for ERB, HAML and Slim editing, coupled with advanced web development tools and a built-in Rails console, is the best recipe for producing cutting-edge Web applications. RubyMine brings all the essential productivity boosters to the world of RubyMotion apps. Code insight is available for Ruby, Objective-C and Java APIs, making iOS, macOS and Android development with RubyMotion even more pleasant. With a powerful testing and debugging UI, working either with a simulator or a real device, it is much easier to fine-tune your application code. All Rake commands and an interactive console are at your disposal as well. The value of testing should not be underestimated. Like writing code, unit-testing becomes second nature with RubyMine‘s flexible, well-thought-out RSpec, Cucumber, Shoulda, MiniTest and Test::Unit integration. Write tests quickly thanks to intelligent code completion and navigation, and easily run tests and analyze their results with a graphical UI.